1 part vegan-friendly, 1 part health-conscious, 100% pure spicy deliciousness. Photo by writer. Sometimes, nothing can beat a craving for some good ole’ Mexican fare, and with the availability of inexpensive options only a couple blocks from Concordia, many of us students simply cannot resist temptations. But while the fried crispiness of the tacos or the cheesy goodness of the enchiladas may have our taste buds declaring “Me gusta!” our bodies reactions to these fiestas of flavors are unfortunately at the other side of the spectrum. Let’s be honest, who can say no to that beautifully colored basket of homemade fried tortilla chips, paired so eloquently with sour cream, guacamole and salsa? And come on, vegetable fajitas? That HAS to be healthy! A basket of chips, 6 flour tortillas packed with oil soaked vegetables and smothered with sour cream and guacamole later, you’re leaving that place with a little more than you bargained for calorie and fat wise. Mexican fare is a social thing, and we as students know that when the craving hits, nothing can beat indulging with friends over a couple beers. Luckily, I’ve come up with a lighter take on our beloved comfort food-and one that is vegetarian and vegan at that! This healthier version promises a big serving size, for a fraction of the calories and fat. Good carbohydrates, such as whole wheat flour and black beans will provide you with more energy for longer periods and will help you fight fatigue while lowering your chances of storing excess carbs as fat, as opposed to lesser quality carbs found in fried tortilla chips or white flour tortillas. Tofu is a cost efficient and excellent source of protein for any vegetarian/vegan out there, delivering about 10g of feel-full protein per serving, while providing you with healthy omega 3 fats, which contribute to your overall health. And did you know that spicy foods such as cayenne pepper and salsa can speed up your metabolism resulting in faster calorie burning? It’s true, so load up on the spice! With all the great benefits you will reap from this dish, I suppose you could afford to kick back on your patio with some friends over a beer-or two. A student deserves some fun in their life, right? 1. Heat oven to 400 degrees F. Lightly cover both sides of the whole wheat tortilla with cooking spray. Place tortilla in an upside down muffin tray, pushing the center of the tortilla in an indentation in the middle of the muffin tin. Bake until crispy and golden brown alongside edges-approximately 5-7 minutes. 2. Meanwhile, drain tofu by placing it between two cloths and applying pressure. Lightly coat a skillet with cooking spray over medium heat. Crumble tofu and sauté it until lightly browned, approximately 5 minutes. 3. 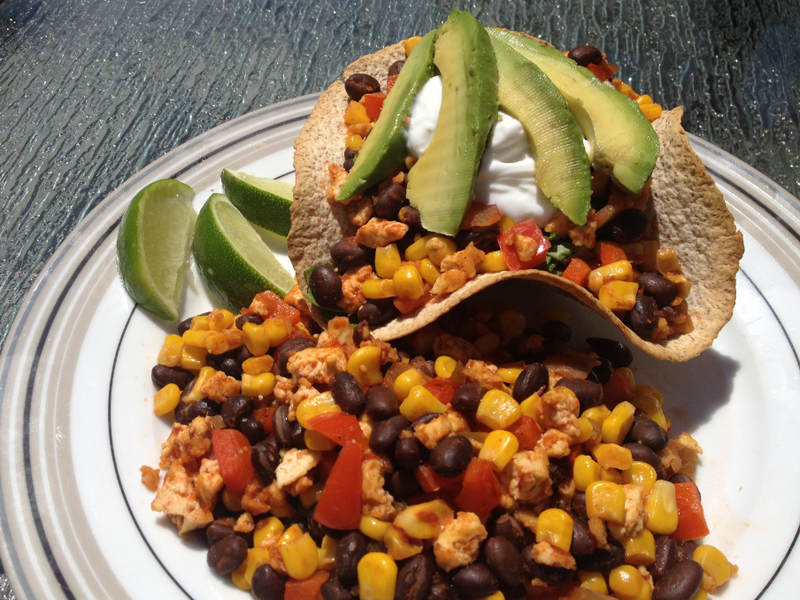 Once tofu is lightly browned, add black beans, canned corn, red pepper, prepared salsa, cayenne pepper, salt and pepper. Sauté together until peppers are slightly softened, approximately 5 minutes. Once they are softened, remove pan from heat and add your cilantro. 4. Place chopped baby spinach at the bottom of your taco shell and cover with the tofu and black bean mixture. Place extra portion alongside your taco shell. Garnish with a couple slices of avocado and a dollop of Greek yogurt (optional for non-vegans) and some fresh lime. Buen Provecho!